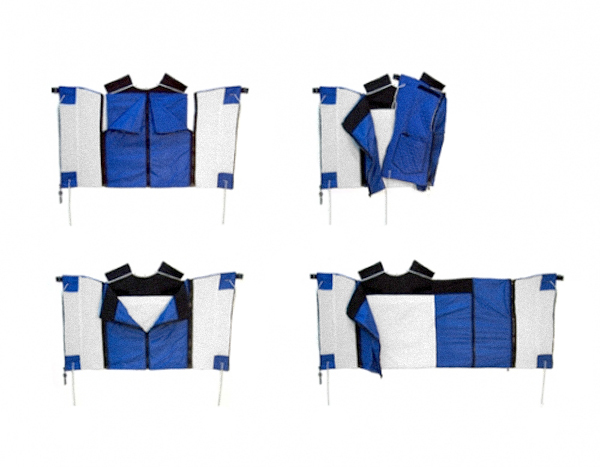 Multifunctional vest which can be used to expres different belief systems. 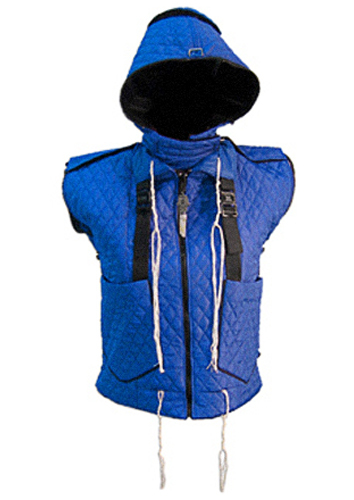 The Frontier Vest is a prototype of a contemporary vest design, which can have different functions, both sacred and profane. It can be worn as a tallit, the Jewish prayer shawl, but it can also turn into a Jewish prayer rug. Inspired by the nomadic life of the Bedouin, the Frontier Vest also represents a useful garment for a contemporary refugee. The Frontier Vest allows for individual expressions of different belief systems. This individual wearable architecture can also be combined to generate a communal space. For this, it needs a congregation of minimally ten in Judaism (minyan), two in Islam (masjid) and three in Christianity. Yet more importantly, this individual territory can only become collective through overcoming the fear of mutual otherness. The vest can be worn by both men and women, and can be used in Jewish and Islamic religions within individual religious communities in the future. Exhibition Liminal Spaces / Grenzräume, Gallery for Contemporary Art Leipzig (Germany); project Liminal Spaces, organised as a collaboration of the Israeli Centre for Digital Art Holon (Israel), the Palestinian Association for Contemporary Arts PACA and the University of the Arts Berlin (Germany).